What is an arm lift/reduction? Changes in weight, growing older and genetics can cause your upper arms to have a drooping, sagging appearance. Exercise may strengthen and improve the underlying muscle tone of the upper arm, but it cannot address excess skin that has lost elasticity or underlying weakened tissues and localized fat deposits. Results in a more toned and proportionate appearance, if you have excess fat you might need liposuction as well, reduces excess skin and fat between the underarm and the elbow, reshapes your arm to result in smoother skin and contours. 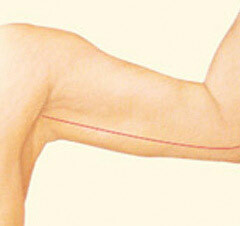 It is a surgical procedure that reshapes the under portion of the upper arm, from the underarm region to the elbow. The procedure is performed to; Reduce excess sagging skin that droops downward, tighten and smooth the underlying supportive tissue that defines the shape of the upper arm, reduce localized pockets of fat in the upper arm region. Is it the correct operation for me? You’ll be asked a number of questions about your health, desires and lifestyle, you must be honest in your answers. Expected outcomes of arm lift surgery and any risks or potential complications. Prior to surgery, you may be asked to: have a preoperative screen and blood tests, take certain medications or adjust your current medications, stop smoking four weeks advance of surgery, avoid taking aspirin, anti-inflammatory drugs and herbal supplements as they can increase bleeding. Special instructions you receive will cover: Post-operative care and follow-up, and What to do on the day of surgery. You will need to wear a garment either a long sleved lycra cycling shirt, or order a post arm reduction garment from one of the many websites in the UK supplying such items prior to your surgery. Medications are administered for your comfort during the surgical procedures. The choices include intravenous sedation and general anaesthesia. We will recommend the best choice for you. Incision length and pattern depend on the amount and location of excess skin to be removed, as well as the best judgment of your plastic surgeon.Incisions are generally placed on the inside of the arm or on the back of the arm, depending on the surgeon’s preference, and may extend from the underarm (axilla) to just above the elbow. 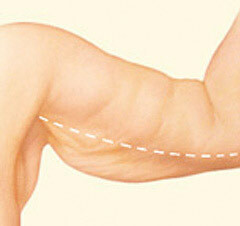 If fat is to be reduced during your arm lift, it will be excised or treated with liposuction. The minimal Incision Technique, with an incision hidden in the arm pit, can be supplemented by VASER liposelection, which can tighten the skin. However the tightenening is varable, and depends on skin type and thickness. This can be tried with the proviso that a further procedure might be required with a long inner arm scar. I usually close your incisions with absorbable sutures, sometimes I use stitches that will be removed within 2 weeks following your arm lift. With the minimal incision techniques deep sutures are placed to the deep fascia. Drains will often be used, which will need to be removed. The smoother, tighter contours that result from brachioplasty are apparent almost immediately following your procedure, although initial results will be somewhat obscured by swelling and bruising. Your new, shapely and toned upper arm is much improved both in appearance and feel. The decision to have arm lift surgery is extremely personal and you’ll have to decide if the benefits versus the risks and potential complications are acceptable. You will be asked to sign consent forms to ensure that you fully understand the procedure you will undergo and any risks and potential complications. Potential complications will be fully discussed prior to your consent. It is important that you address all your questions to me at the consultation. Wear your tapes for the first week, and then your post arm reduction garment for a further 5 weeks. Surgery is not an exact science and although good results are expected, there is no guarantee. In some situations, it may not be possible to achieve optimal results with a single surgical procedure and another surgery may be necessary. Surgical incisions must not subjected to excessive force, swelling, abrasion, or motion during the time of healing. You will be given you specific instructions on how to care for yourself. It’s very important to ask us questions about your arm lift procedure. It’s natural to feel some anxiety, whether it’s excitement for your anticipated new look or a bit of preoperative stress. Don’t be shy about discussing these feelings. You will have tapes on for a week after surgery. You will see the nurse one week later for removal of tapes, and help into your garment. Generally absorbable sutures are used although sometimes sutures need to be removed at two weeks. You can resume office/ normal activity at two weeks and exercise at six weeks? You will see the nurse at one week, and me at regular intervals? Cost is always a consideration in elective surgery. The cost for an arm lift may vary based on the type of procedure used, as well as the hospital used. Some hospitals have cheaper costs, but very limited time slots, others have more availability, but higher costs, some of the more expensive hospitals have more extensive insurance in place (but this is not always the case). However a one off inclusive fee will be calculated. When choosing a plastic surgeon for an arm lift, remember that the surgeon’s experience and your comfort with him or her are just as important as the final cost of the surgery.